This is my first time making these. And this is my last CNY bake for this year. 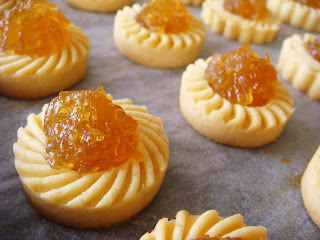 Pineapple tarts using home made pineapple jam. 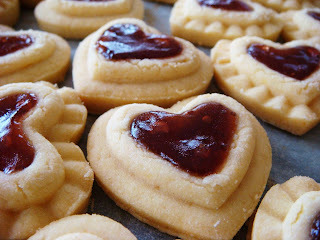 Strawberry hearts using store bought jam. 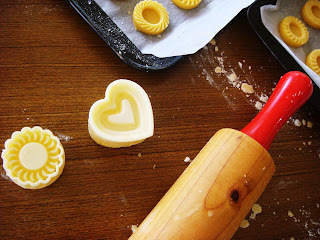 Beat egg yolks, butter, vanilla and icing sugar until light and fluffy. 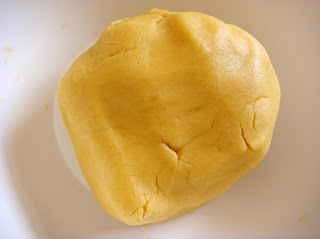 Sift in flour and custard powder. Combine thoroughly and form a dough. Add more flour if too sticky still. 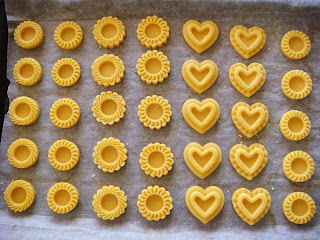 Roll out and use cookie cutters. Bake in a preheated oven at 160C for 15-20 minutes or until golden brown. In a saucepan, cook pineapple and sugar on low heat until soft and mushy. 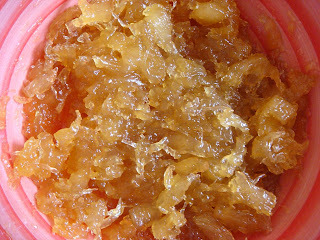 Continue to cook until most of the liquid is no longer there, and the mixture is of jam consistency. Amazing and all the cookies look so inviting. 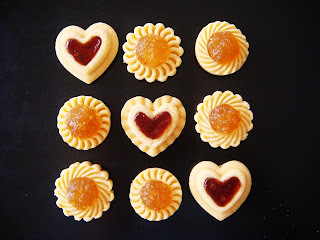 I love the idea of celebrating both V-Day and CNY's with one recipe. 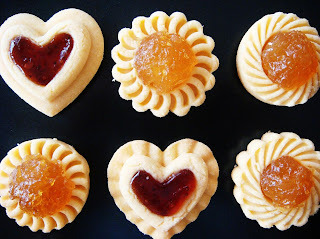 (I know what I'm baking for Valentine's Day but I have no idea what to make for Chinese New Year's.) 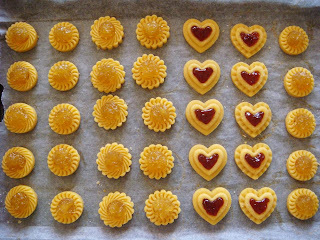 Btw, your tarts look yummy! i love the cookie cutters you got. 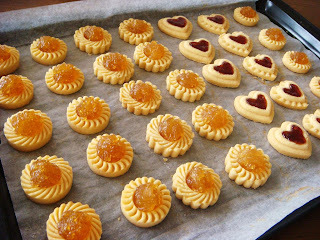 and you made such lovely cookies with them! WOw very pretty. How were you able to do 6 designs with only 2 cutters? They were awesome cutters that I got in KL! I also found them in Sg recently too. The round/flower one had 2 different outer designs and 2 different imprints.. giving you 4 combinations! Then the heart one had one outer design (ie. the heart) and 2 different imprints. Genius cutters right? Hehe!